This article has been amended to include a factual correction. To read the erratum, click here. The online article and its erratum are considered the version of record. To perform a comparative clinical analysis of the safety, efficacy, and predictability of two surgical procedures (ie, small incision lenticule extraction [SMILE] and femtosecond laser-assisted LASIK [FS-LASIK]) to correct myopia. Sixty eyes of 31 patients with a mean spherical equivalent of −5.13 ± 1.75 diopters underwent myopia correction with the SMILE procedure. Fifty-one eyes of 27 patients with a mean spherical equivalent of −5.58 ± 2.41 diopters were treated with the FS-LASIK procedure. Postoperative uncorrected and corrected distance visual acuity, manifest refraction, and higher-order aberrations were analyzed statistically at 1 and 3 months postoperatively. No statistically significant differences were found at 1 and 3 months in parameters that included the percentage of eyes with an uncorrected distance visual acuity of 20/20 or better (P = .556, .920) and mean spherical equivalent refraction (P = .055, .335). At 1 month, 4 SMILE-treated eyes and 1 FS-LASIK–treated eye lost one or more line of visual acuity (P = .214, chi-square test). At 3 months, 2 SMILE-treated eyes lost one or more line of visual acuity, whereas all FS-LASIK–treated eyes had an unchanged or corrected distance visual acuity. 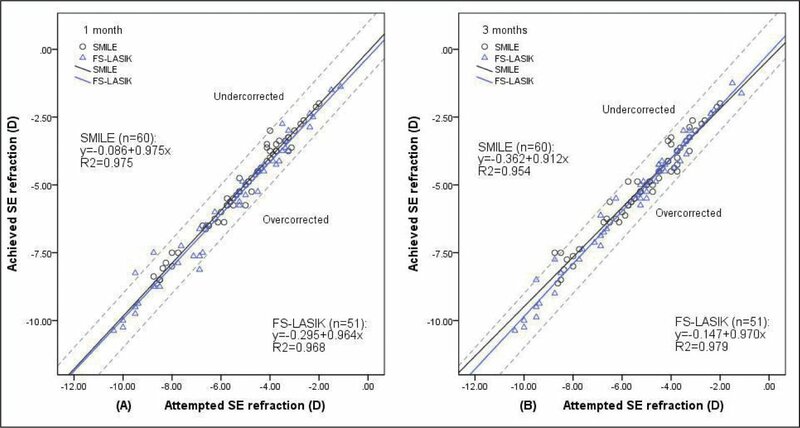 Higher-order aberrations and spherical aberration were significantly lower in the SMILE group than the FS-LASIK group at 1 (P = .007, .000) and 3 (P = .006, .000) months of follow-up. SMILE and FS-LASIK are safe, effective, and predictable surgical procedures to treat myopia. SMILE has a lower induction rate of higher-order aberrations and spherical aberration than the FS-LASIK procedure. From the Department of Ophthalmology, Second Affiliated Hospital, College of Medicine, Zhejiang University, Hangzhou, China. This article has been amended to include a factual correction. An error was identified subsequent to its original printing. On page 250 of the article “Comparison of the Visual Results After SMILE and Femtosecond Laser-Assisted LASIK for Myopia” by Lin et al., which was published in the April 2014 issue of the Journal of Refractive Surgery, the P value of 1.101 should be .101. This error was acknowledged on page 582, volume 30, issue 9. The online article and its erratum are considered the version of record. Despite the development of femtosecond lasers, HOAs have shown an increase postoperatively in previous studies.3,5 It has been postulated that the creation of a corneal flap and the induction of localized inflammation associated with excimer laser use may play an important role in producing these changes. The aim of this study was to evaluate the comparative safety, efficacy, and predictability of SMILE with that of femtosecond laser-assisted LASIK (FS-LASIK) at 1 and 3 months postoperatively. Comparisons were made between the two treatment arms of the study using uncorrected distance visual acuity (UDVA) and corrected distance visual acuity (CDVA), refractive diopters (D), and HOAs. This prospective comparative study involved 58 patients (111 eyes) who were scheduled for myopic correction at the Second Affiliated Hospital of Zhejiang University, Hangzhou, China, between May and December 2012. All patients were randomly allocated into one of two treatment groups (SMILE or FS-LASIK) per their own choice. Inclusion criteria consisted of a minimum age of 18 years, a stable refractive error for at least 2 years (⩽ −0.25 D), a CDVA of 20/25 or better, sphere ranging from −0.00 to −10.00 D, cylinder ranging from −0.00 to −4.00 D, minimum corneal thickness of 500 μm, and the absence of systemic or localized ocular disease. This study was approved by an ethics committee and followed the tenets of the Declaration of Helsinki. Written informed consent was received from all patients. Preoperative examination included UDVA and CDVA, slit-lamp examination, noncontact tonometry, refraction (ie, manifest and cycloplegic), ultrasonic pachymetry, funduscopy, endothelial cell count, B-scan ocular ultrasound corneal fluorescein staining, corneal topography (Orbscan II; Bausch & Lomb, Rochester, NY), and wavefront aberrations (CRS-Master system; Carl Zeiss Meditec, Jena, Germany). In this study, CDVA measurement was recorded with an upper limit of 20/20. Patients had to discontinue wearing contact lenses for at least 2 weeks (for soft lenses) or 3 weeks (for hard lenses) prior to the assessment. SMILE Procedure. All surgical procedures were performed by the same surgeon (YY). Eyes were preoperatively anesthetized with 0.4% oxybuprocaine eye drops. After standard sterilization and sterile draping, an eyelid speculum was used to keep the eye open. A VisuMax femtosecond laser (Carl Zeiss Meditec) was used for SMILE. The patient’s eye was positioned under the interface cone, and the patient was asked to fixate on a blinking green target. The cone was connected to suction ports. When the surgeon confirmed that an appropriate centration (ie, center of pupil) had been achieved, suction was applied to the cone. Once suction was on, delivery of the femtosecond laser pulses was initiated to begin the entire lenticule creation. During this period, the contact glass of the cone remained fixed on the cornea, and the patient was required to observe the blinking target. Four subsequent femtosecond incisions were performed. The first incision created the posterior surface of the lenticule (from periphery to the center). The second incision consisted of a vertical side cut made all around the lenticule (the depth of the cut was the cap thickness). The third incision created the anterior surface of the lenticule (from center to periphery). Finally, the fourth was a small incision of 50° to create access to the lenticule. It was located at 120° off the corneal surface, with a circumferential length of 4.0 to 5.0 mm and a side-cut angle of 90°. Thickness of the lenticule depended on the refractive error to be corrected, with a diameter of 6.1 to 6.6 mm in all cases. Thickness of the cap was 100 μm, and its diameter was 7.0 to 7.5 mm. All steps were created with the femtosecond laser using energy of 120 nJ. Once the lenticule creation was completed, suction was released automatically. A thin spatula was inserted through the side cut to separate the lenticule (first the anterior and then the posterior surface), and it was subsequently grasped with non-toothed serrated forceps. FS-LASIK Procedure. A VisuMax femtosecond laser (Carl Zeiss Meditec) was used for FS-LASIK flaps and subsequent photoablation was performed with a MEL-80 excimer laser (Carl Zeiss Meditec). The steps for preoperative preparation, confirmation of appropriate centration, and initiation of suction were done using the same procedures described above for the SMILE group. Surgical parameters were as follows: flap diameter was 7.9 mm and its intended thickness was 85 to 100 μm, with the hinge at the 12-o’clock position. The side-cut angle was 90°; spot spacing and track spacing were between 2 and 3 mm. For excimer ablation, aspheric ablation profiles (ie, aspheric smart ablation) using a personal adjustment nomogram were applied. Once the excimer ablation was completed, the flap was repositioned. At the end of the two procedures, the cornea was irrigated with saline and all patients received one drop of tobramycin/dexamethasone. The postoperative regimen included loteprednol and levofloxacin eye drops for 1 week. The patients were encouraged to use lubricating drops as needed to improve comfort. Postoperative follow-up was at 1 day and 1 week after the surgery. Complete ophthalmic evaluations were conducted at 1 and 3 months postoperatively. The following parameters were obtained in the latter two examinations: UDVA and CDVA, manifest refraction, noncontact tonometry, ultrasonic pachymetry, corneal topography, and wavefront aberrations. All statistical analyses were performed with SPSS version 19.0 (SPSS, Inc., Chicago, IL). Chi-square tests were used to compare the results of various groups, independent t tests were used to compare data between the two groups, and paired t tests were used for statistical analysis to compare data before and after each treatment. All values are given as the mean ± standard deviation. A P value of less than .05 was considered statistically significant. At 1 and 3 months, 111 eyes were observed. The SMILE group included 60 eyes of 31 patients (15 men and 16 women) with ages ranging from 18 to 40 years. Intended myopic spherical correction ranged from −1.75 to −7.75 D and cylinder ranged from −0.00 to −2.00 D. The FS-LASIK group included 51 eyes of 27 patients (18 men and 9 women) with ages ranging from 18 to 39 years. Intended myopic spherical correction ranged from −1.00 to −9.75 D and cylinder ranged from −0.00 to −3.75 D. Detailed clinical data are shown in Table 1. All eyes had emmetropia as the target refraction. The efficacy index (mean postoperative UDVA/mean preoperative CDVA) was 0.99 ± 0.15 and 1.04 ± 0.20 at 1 and 3 months, respectively, in the SMILE group and 1.02 ± 0.17 and 1.10 ± 0.23, respectively, in the FS-LASIK group. 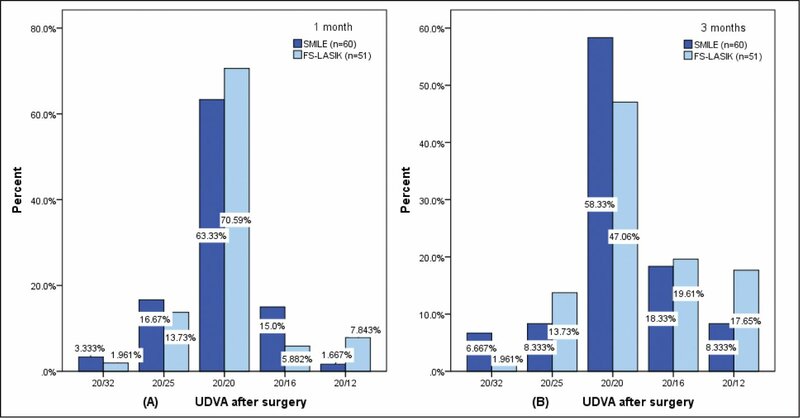 Figure 1 shows the UDVA of the SMILE and FS-LASIK groups at 1 and 3 months. The eyes with a postoperative UDVA of 20/20 or better all reached preoperative CDVA, and the differences at 1 (chi-square test2 = 0.347; P = .556) and 3 (chi-square test2 = 0.010; P = .920) months were not statistically significant. A distribution of uncorrected distance visual acuity (UDVA) at (A) cumulative 1 month and (B) 3 months postoperatively. Forty-eight (80.00%) of 60 eyes in the small incision lenticule extraction (SMILE) group and 43 (84.31%) of 51 eyes in the femtosecond laser-assisted LASIK (FS-LASIK) group had 20/20 or better at 1 month, whereas 51 eyes (85.00%) in the SMILE group and 43 eyes (84.31%) in the FS-LASIK group had 20/20 or better at 3 months. The safety index (mean postoperative CDVA/mean preoperative CDVA) was 1.00 ± 0.06 and 1.01 ± 0.05 at 1 and 3 months, respectively, in the SMILE group and 1.00 ± 0.03 and 1.01 ± 0.03, respectively, in the FS-LASIK group. Figure 2 shows the percentage of eyes in which there was a gain or loss of Snellen visual acuity lines compared with preoperative levels at 1 and 3 months. No suction loss or other complications during surgery and no signs of postoperative ectasia were noted. The percentage of eyes in which there was a gain/loss of Snellen visual acuity lines compared with preoperative levels for different postoperative periods. 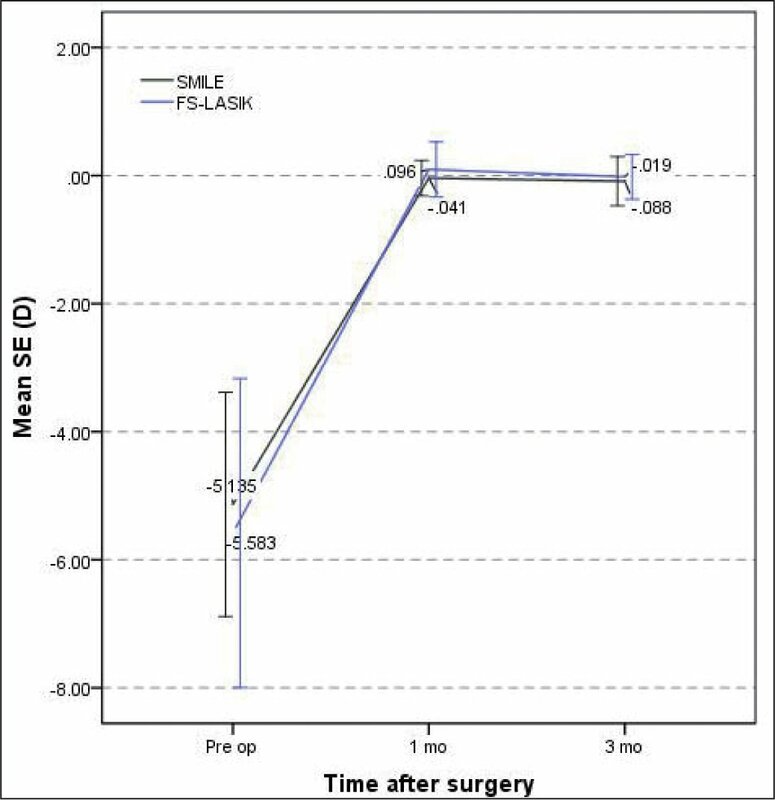 (A) At 1 month, 4 eyes (6.67%) in the small incision lenticule extraction (SMILE) group and 1 eye (1.96%) in the femtosecond laser-assisted LASIK (FS-LASIK) group lost one or more line. 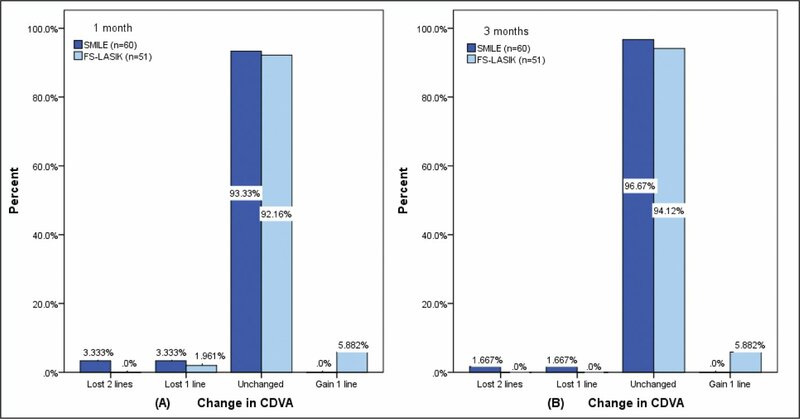 (B) At 3 months, 2 eyes (3.33%) in the SMILE group lost one or more line, whereas all FS-LASIK–treated eyes had an unchanged corrected distance visual acuity (CDVA). At 1 month, the mean spherical equivalent (SE) was −0.04 ± 0.28 D (range: −1.00 to +0.75 D) in the SMILE group and 0.10 ± 0.43 D (range: −1.25 to +1.25 D) in the FS-LASIK group (P = .055). At 3 months, the mean SE was −0.09 ± 0.38 D (range: −1.25 to +0.75 D) and −0.02 ± 0.35 D (range: −1.00 to +0.5 D; P = .335), respectively. Figure 3 shows a scatter plot and linear regression analysis of the attempted SE refractive change plotted against the achieved SE refractive change postoperatively. 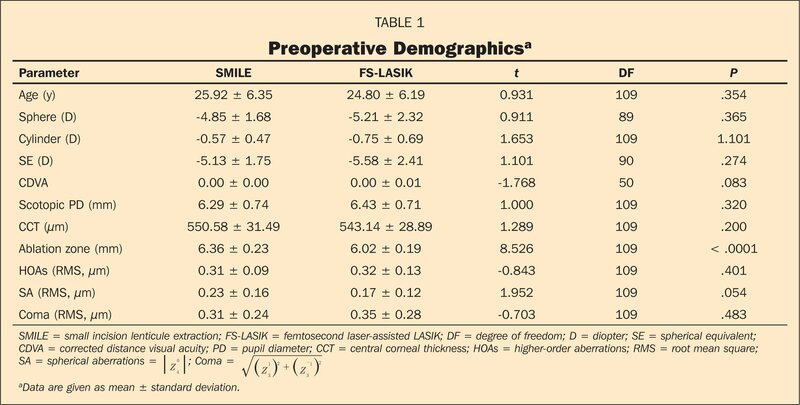 There was no significant difference between the regression coefficient of the SMILE and FS-LASIK groups at 1 (P = .053) and 3 (P = .061) months. Attempted spherical equivalent (SE) refractive change plotted against the achieved SE refractive change. (A) At 1 month, 60 (100%) eyes in the small incision lenticule extraction (SMILE) group and 48 (94.12%) eyes in the femtosecond laser-assisted LASIK (FS-LASIK) group had a SE within ±1.0 diopter. (B) At 3 months, it was 59 (98.33%) and 51 (100%), respectively. Additionally in Figure 4, the mean SE plotted as a function of time in both groups shows the stability over the 3-month follow-up period. When the number of eyes with a change within ±0.5 D in SE between 1 and 3 months was compared in the two groups, no significant difference was found (χ 2=0.862; P = .353). Mean spherical equivalent (SE) plotted as a function of time postoperatively in the small incision lenticule extraction (SMILE) and femtosecond laser-assisted LASIK (FS-LASIK) groups over the 3-month follow-up period. Only 1 eye in the FS-LASIK group had a change in SE outside ±1.0 diopter (range: 1 to 3 months). 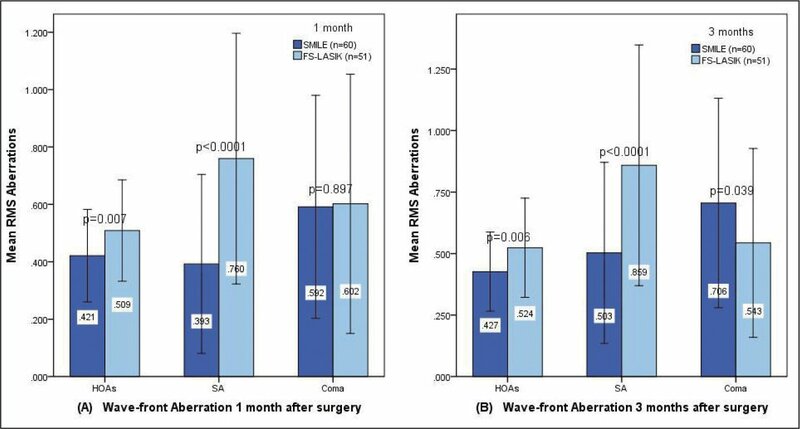 The total number of HOAs, including spherical aberration and coma, was not statistically significantly different preoperatively in the SMILE and FS-LASIK groups (Table 1). Data that compared these parameters before and after treatment demonstrated that they increased significantly (P < .05) in each group. Figure 5 shows the comparison of mean root mean square aberrations in the SMILE and FS-LASIK groups postoperatively. At 1 and 3 months, results are mainly attributed to the significantly lower HOAs and spherical aberrations in the SMILE group compared with the FS-LASIK group. Comparison of mean root mean square (RMS) aberrations in the small incision lenticule extraction (SMILE) and femtosecond laser-assisted LASIK (FS-LASIK) groups at (A) 1 and (B) 3 months postoperatively. In our study, both SMILE and FS-LASIK showed excellent efficacy, safety, and predictability. The efficacy and safety indices were comparable with the studies for the femtosecond lenticule extraction procedure by Kamiya et al.,9 SMILE by Hjortdal et al.,8 and FS-LASIK by Chan et al.10 When comparing proportions of eyes with a UDVA of 20/20 or better, we found results similar to those of previous studies with SMILE5,7 and FS-LASIK.5,11 All patients reported that they were satisfied with both treatments. Concerning CDVA and safety, there was no increase in intraocular pressure and no vision-threatening complications occurred. There was a recovery trend in both groups as time passed; however, we did not have a longer follow-up to see CDVA changes. We considered that interlayer scattering and dry eye might be the reasons for the loss of CDVA, regardless of slightly decentered cutting,8 and we observed similar results in previous studies with SMILE by Sekundo et al.6 and Shah et al.7 Concerning predictability, with emmetropia as the target in our study, both SMILE and FS-LASIK groups had a favorable tendency toward emmetropia at 1 and 3 months. In a study with femtosecond lenticule extraction and FS-LASIK (preoperative SE were −7.50 ± 1.16 D and −7.32 ± 1.09 D, respectively), Vestergaard et al.5 reported 3-month results that SMILE-treated eyes were closer to emmetropia than the FS-LASIK–treated eyes. This study mainly concerned highly myopic patients. The patients in our study did not suffer from as high of a degree of myopia. Further research is still needed to confirm the statistically significant differences. In the current study, significant differences were not found in refraction diopters between the SMILE and FS-LASIK groups postoperatively. Our results are promising and comparable with those published by Shah et al.7 and Sekundo et al.6 (both of which focused on SMILE) and by Chan et al.10 and Gertnere et al.12 (who both studied FS-LASIK). In general, both procedures were safe and effective, but a longer follow-up period is essential to further verify the stability of the results. HOAs play an important role in visual quality. Our results suggest that the use of the femtosecond laser (in both SMILE and FS-LASIK) still induced total HOAs, spherical aberrations, and coma. Our results qualitatively agree with the results reported by Shah et al.7 (who analyzed a pupil diameter of less than 5.0 mm), Sekundo et al.6 (who focused on SMILE), and Au and Krueger11 (who focused on FS-LASIK). In the current comparative study, we also found total HOAs and spherical aberration were significantly lower in the SMILE group compared to the FS-LASIK group at 1 and 3 months. This was an anticipated finding, because Vestergaard et al.5 and Gertnere et al.12 also noted a minimal increase in spherical aberration in femtosecond lenticule extraction without an increased incidence of increased coma when compared to FS-LASIK. In patients with myopia who had a larger pupil diameter, spherical aberration caused more pronounced problems than coma-like aberration. Thus, spherical aberration was a crucial factor in night vision disturbance in this subset of patients.13 Spherical aberrations commonly increase after LASIK procedures. Surgery modifies the normal aspheric system of the cornea and makes the cornea flatter by changing the physiological curvature of the anterior corneal surface. This is a necessary consequence of the refractive correction procedure. The equilibrium state maintained by the original positive spherical aberration of cornea and negative spherical aberration of the lens is destroyed, which contributes to the introduction of spherical aberration. The aspheric smart ablation profile was used in SMILE and FS-LASIK groups in our study, so corneal curvature was not an explanation for the significant differences in spherical aberration. On the other hand, the creation of a flap is another important reason for the induction of HOAs. Several articles have reported that flaps made by femtosecond lasers were smoother and more regular when compared with mechanical microkeratomes and that use of the lasers significantly decreased the number of HOAs.14–16 However, several other studies have suggested that the differences in inducing whole-eye aberrations among various types for flap creation have not been clinically or statistically significant.17 Severing the interlayer corneal collagen weakens the cross-links of the collagen and changes biomechanical stability, resulting in the induction of HOAs, especially the spherical aberrations. Both SMILE and FS-LASIK were safe, effective, and predictable for treating myopia. FS-LASIK induced a greater increase in spherical aberration than SMILE. Further studies with larger numbers of eyes and a longer follow-up period are required to corroborate our results. Ideally, preoperative myopia degrees should also be evaluated as a grouping criterion in the patient population. Oshika T, Tokunaga T, Samejima T, Miyata K, Kawana K, Kaji Y. Influence of pupil diameter on the relation between ocular higher-order aberration and contrast sensitivity after laser in situ keratomileusis. Invest Ophthalmol Vis Sci. 2006;47:1334–1338. Medeiros FW, Stapleton WM, Hammel J, Krueger RR, Netto MV, Wilson SE. Wavefront analysis comparison of LASIK outcomes with the femtosecond laser and mechanical microkeratomes. J Refract Surg. 2007;23:880–887. Mok KH, Lee VW. Effect of optical zone ablation diameter on LASIK-induced higher order optical aberrations. J Refract Surg. 2005;21:141–143. Riau AK, Angunawela RI, Chaurasia SS, Lee WS, Tan DT, Mehta JS. Early corneal wound healing and inflammatory responses after refractive lenticule extraction (ReLEx). Invest Ophthalmol Vis Sci. 2011;52:6213–6221.